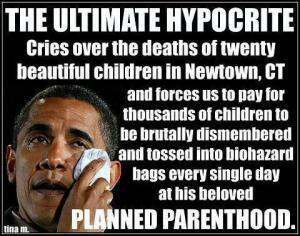 Who’s Really a Hypocrite? Let’s Not Forget Me. Brutal. Poor guy. I do love the graphic design of the last one. 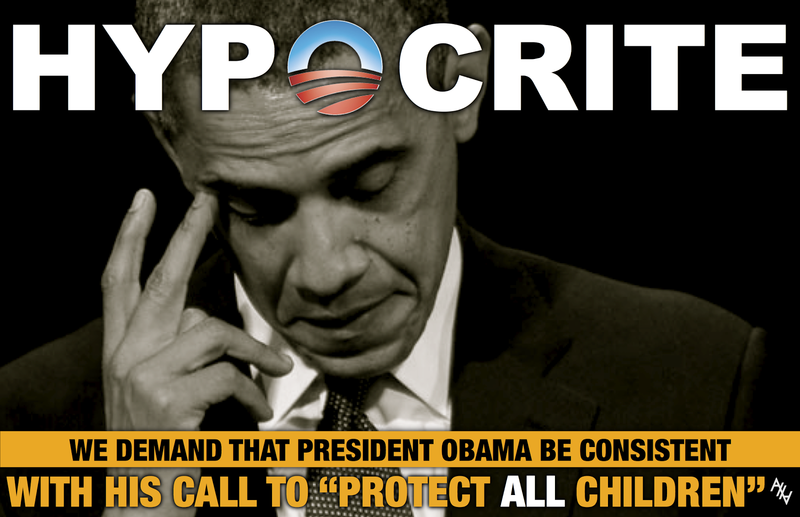 Putting the Obama O in “hypocrite” was a smart move. But, in the interest of making all things equal, here’s mine. The one on the left is the me that I like to present to the world, the one that I want to be in the church and like to show myself to be around Christians. It’s what I generally hope to be, and I think there are times, by God’s grace, when I am all of those things. But the right is what I really am a lot of the time. Sometimes, Jesus is Lord in my life. 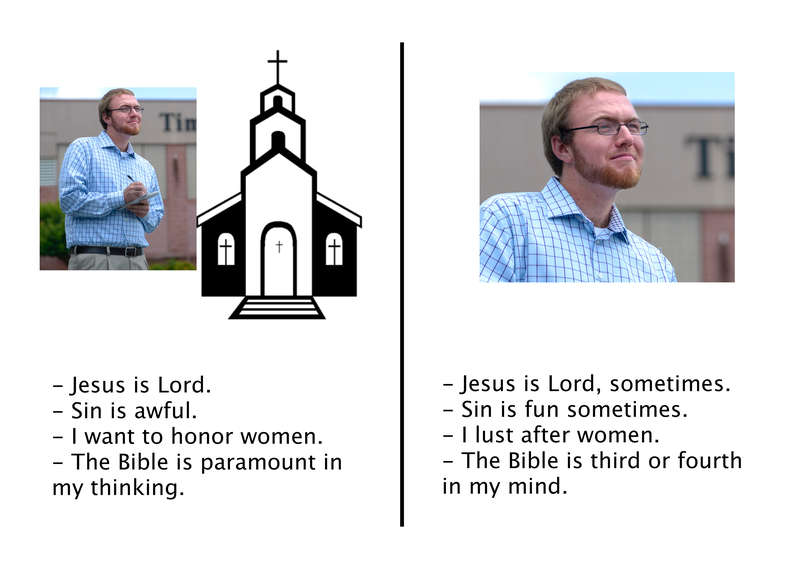 Sometimes sin is too fun to think that it’s awful. I deal with lust in my heart and my eyes all the time. And the Bible, while I want to put out that it’s always the primary lens through which I view the world, sometimes it falls down the list. 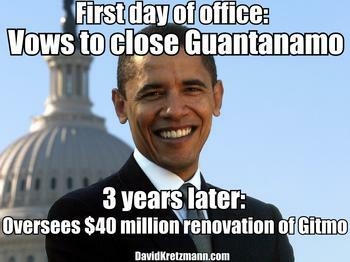 Is it an accurate statement to call President Obama a hypocrite? Sure. It’s also an accurate statement to call me a hypocrite. It’s also an accurate statement to call Paul a hypocrite. He said it himself in Romans 7:15 and 18-23. For I do not understand my own actions. For I do not do what I want, but I do the very thing I hate…For I know that nothing good dwells in me, that is, in my flesh. For I have the desire to do what is right, but not the ability to carry it out. For I do not do the good I want, but the evil I do not want is what I keep on doing. Now if I do what I do not want, it is no longer I who do it, but sin that dwells within me. So I find it to be a law that when I want to do right, evil lies close at hand. For I delight in the law of God, in my inner being, but I see in my members another law waging war against the law of my mind and making me captive to the law of sin that dwells in my members. What did Paul have a beat on in his writing? There’s a natural conflict within the heart and the body of man. We may desire to do what is good and what is right, but oftentimes we don’t do those things. We desire to not do something, but we do it anyways. EVERYONE is a hypocrite. Think about your own life. What are things that you’ve said in the presence of Christians or in a church setting? Have you gone back on those things? Have you broken your word? Have you been a hypocrite? Odds are, you have. In fact, I’m about 99.9 percent sure that you have. I know 100 percent that I have. There are days where I pray against me doing something, fully desiring to avoid that thing, but I do it anyways. In that way, really, I’m a hypocrite before God. I’m willing to put my hypocrisy up against anybody’s and dare it to be worse than mine. I’m not trying to brag on my sin, I’m simply trying to say I’m pretty crappy most days, if not all days. If it weren’t for the grace of God, I’d be damned to hell in an instant. But the beauty of the Gospel is that my hypocrisy, unlike Obama’s, doesn’t lower my approval rating with my constituency. God sees my hypocrisy and loves me the same. Nothing I do can remove His love from me. So what’s the best way to kill hypocrisy? Go ahead and say you’re a sinner. Make it plain to the world. I don’t want to be a hypocrite. But I am. Just like Obama. Likely, just like you. And I’m OK with that.